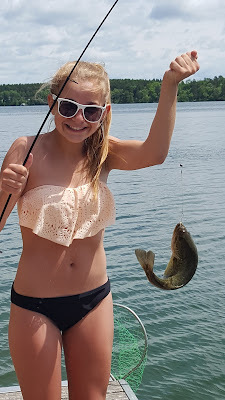 Hailey, age 13, caught this Largemouth Bass on Long Lake about 11am on June 1st. She was vacationing with her parents, Scott and Brenda, and her two sisters, Rachel and Jessie. The family cabin is on the west side of Long Lake south of Breezy Point. The girls were fishing from their dock and used a crappie minnows for bait. Hailey loves to fish. The family kept the bass in their live box for two days and then let it go to hopefully catch another day. Remember you have until June 24 to get your entries into the Long Lake Area Association's Kids Fishing Contest. For full details click on the Kid's Fishing Contest tab located above on the green menu bar. Keep those pictures coming: Only 14 days left!